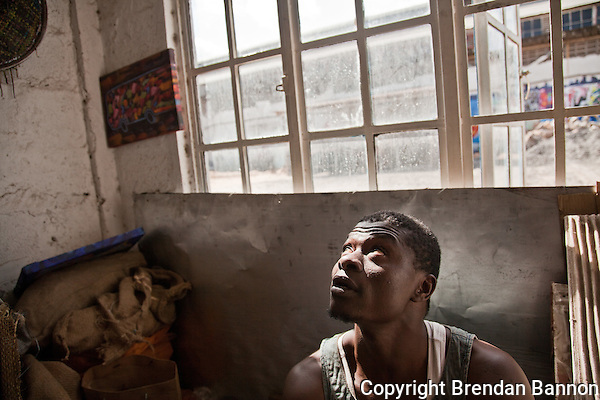 INDUSTRIAL AREA, April 5, 2011 (Daily Dispatches) – Mid-morning Mondays, round the back of Nairobi’s middle-class pubs, you’ll find Dickens Otieno waiting. He’s after the empty beer and cider cans swept up after the weekend’s merrymaking. For this 32-year-old artist, trash tin is sprung tight with colorful potential, waiting to be reborn. Otieno is one of the hundreds of painters and sculptors struggling to make a living in a city far from famous for its art, or its art market. Galleries are closing, the few art buyers are hit by the economic crisis, and allegations swirl of cartels of middle-men manipulating international dealers into choosing work by a select few. A year ago, as paint prices rose and picture sales fell, Otieno switched from brush and canvas to metal-cutters and tin. At least his raw materials were now free. Today, in his rented corner of a studio in an artists’ enclave in Nairobi’s Industrial Area, he’s experimenting with what he calls “weaving”. On a mesh of chicken wire, he’s feeding strips of tin in and out, creating a patchwork of woven metal which becomes his new canvas. Last year, he sold six pieces crafted from this novel approach, for as much as $600 each. “The market here only wants Masai figures or wild animals, that’s what the tourists buy, that’s what people here understand,” he said. The “risk” he talks about is that the few spots around Nairobi where art is displayed and sold will refuse your work if it is too unconventional. The city’s best-known modern art gallery, RaMoMa, closed last year. Another, Gallery Watatu, has been recently refurbished but it is not yet clear if it will take experimental work from local newcomers. Without space to exhibit, many here fear they will never win the exposure they need to break into big-money international markets which have so far focused on work coming out of Africa’s west and south. “I have to say there are some places here which have a kind of goodwill towards artists, but they are still wanting a certain type of painting,” said Tom Mboya, who shares Otieno’s studio. Beside him, Esther Mukuhi, who also works from the same shared studio, nodded in agreement. Despite the challenges, however, there is hope. 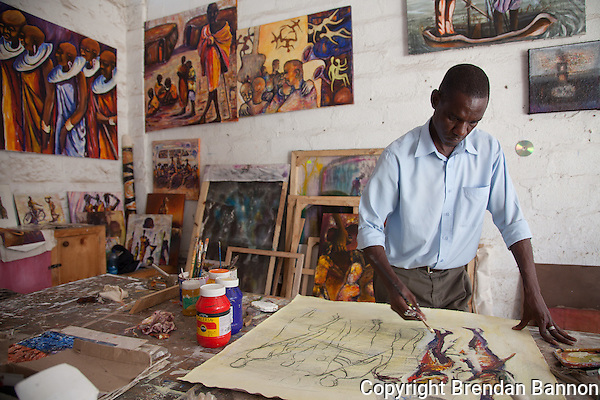 In the next-door studio, Dickson Kaloki stood before a painting of a ghostly female figure overlaid by the outlines of slum shacks. This entry was posted on Tuesday, April 5th, 2011 at 3:14 pm. It is filed under Features, Working. You can follow any responses to this entry through the RSS 2.0 feed. Artist Tom Mbaya- I am an artist myself here at Buffalo State. It’s hard for artist today even here in the USA to make it. I seen a little of what Artist Tom Mbaya has done and I like his work already. Maybe your artist can somehow put their work on the Internet maybe they will be able to get a response for someone to see their work and want to buy it. This way they can get exposed and their work too.